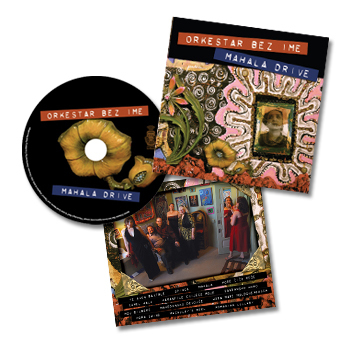 In a departure from its previous albums, Orkestar Bez Ime wanted a less folky, more edgy sound and look to their latest work to showcase the new musician line-up: Songs take on a more mysterious sound and play with sound design techniques. 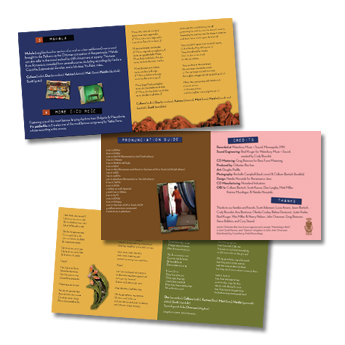 To support the new direction, artwork by local mixed-media artist Doug Padilla provided the backdrop and color palette, with elements from his piece and photography by fiddle player Collen Bertsch serving as accents throughout the booklet. Typography set in old-school label tape reflected the more traditional origins of the band's music, while a floral brooch from Padilla's work was made to look like a phonograph against the black LP-like background on the disc imprint.